Does anyone know what palette is used for TS's SideNC01.mix's SHP's? Can't find any palette that makes them show right. What are you talking about.. See the ts shp header i posted in the same post where the Icon(tmp) header is. Oh you mean the unknown bit before offset in a frames's header (Not the SHP Header). I thought you meant the first two bytes of the SHP Header which people call Zero (Since its always a Zero). I noticed a small error, though: The last colour in the palette (#255) is actually affected by the ambient lighting. So only colours from #240 to #254 should not be affected by the luminosity change. or non unit*.pal custom palettes, it would give incorrect info. The only issue with limiting it to a palette with a specific name is if someone used a custom palette with a different name. current frame or in the first half of the frames or the whole of the SHP. - tool could show the compression used alongside the frame counter. Im always looking for ideas for features, especially ones people will use (I know from experience i could think something is a good idea for a feature but in reality never gets used). Your ideas are good though what would be the use in knowing what the compression used for each frame is? Hope your palette dropdown extends for longer filenames like unttemmask1ra2bgremap.pal. After finding a hack for the combobox's to make it auto size it now does . As for the custom background image suggestion, it would be very useful if you could load multiple SHPs for one preview. So you don't have to go ingame to check how it turns out. 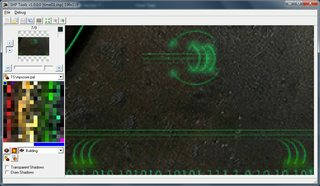 Just load the background image (screenshot of a ingame landscape), load the SHPs, set the loop frames for each SHP and click play for a nice preview. So a list of all SHP's say at the left (Where you select one), click on the middle bit to place a SHP and have the ability to set the frames it plays? May be best as a separate application, unless its meant to be displaying the SHP you have already opened (And say edited) and your just comparing it to other SHP's. Afaik GIF's use a 256 colour palette so there shouldn't be an issue with colours (Just copy the palette over and then the pixels). Importing should be the only place colours can go wrong. though what would be the use in knowing what the compression used for each frame is? for comparison and verification this could be indeed useful. So far you can only change the compression in SHP Builder and then test ingame if anything has changed, but it's still only a blind test. Because if nothing has changed ingame you wouldn't know if SHP Builder made a mistake when saving the SHP, or you when implementing it in the mix etc. Thus a way to actually see/proof the used compression would be useful. Then you could also proof that a certain compression leads to certain artifacts and render layer issues. frames with 1 only. Just for testing different cases. render one SHP over another. That sounds like odd behaviour. I wouldn't have thought compression would have any effect. Have you tried the "Flag" as different values to see if it had an effect (like the first bit flag). My understanding is that shadow frames should be saved without compression. At some stage i plan on either making a custom save dialog or expanding the windows one (Latter being an annoying way.. Windows API stuff is always annoying). If there's no PAL anywhere then the game loads it from a PCX. Seeing the content in that mix mpscore.pcx is likely it. No, it's commonly called A, and that's what i would have referred it to should i mention it. As for what it is its definatly a word not two bytes, its 00s in the shps i've seen, but that doesn't mean it can't have anything else, so far i've only found that the game checks if its -1 and if so doesn't render the shp(does load it tho) and that its somehow related to how the shp is loaded and buffered. As for Zero thats still my running theory that it could be a checksum of a linked file. That's perfectly correct behavior given what the word is for and how the Blittters work. When RLECompressed is on the game uses one of the many RLE blitters as those decompress RLE right before blitting the image to the screen if its off it uses BlitPlain blitters, it's really possible that one of them has a bug somewhere that affects how the shp is drawn(besides the bitfield values that affect it directly and as intended). Stop calling them compressions, there's only ONE, RLE. XCC refers to it as Zero. A is an odd name especially as its always Zero. A word is two bytes long. An unsigned 16bit number. Signed or not doesn't matter when your checking to see if a value is not 0 as 0 is the same with both signed and unsigned. Has anyone tried to strip the SHP's which use the full 4 bytes so that it only contains the compression flag to see if there is any difference in game? Or to take the values from one SHP and shove them into another. I understand that each flag combination has different render paths. 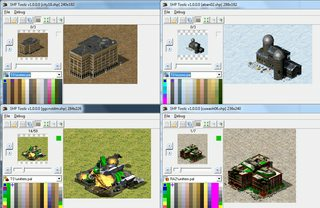 Original War which iv maintained since 2005(And the reason i stopped working on CNC tools) has GM files which are 3d Sprites (One image for pixels and one for Z buffer image). They use separate paths for the different types. But its not correct behaviour to do things differently based on if something is compressed or not. How they should work is identical to each other if only compression is whats different. Are you sure that its the compression being used or not which is what causes issues and not say Bit 1 of the flag being on/off? So do you think compression 1 is better than compression 2 or is compression 3 best? Does that look ok for save options? I'm now going with the assumption that flags is 2 bytes long (Word). Compression options control if flag 2 is used (Which is why the HEX bit states 2 possibilities in the screenshot). Attached is a new SHP Debug file. Flags is now a Word so its displayed differently and the old "Align" is now a Word too. The "Zero" bit before offset is included at the end (Which from what i can see is always Zero). Unknown : Word; // Part of Flags? Something else? Unknown1 : Byte; // Part of Radar Color? Seperate? Interestingly SideNC's have 0056(Bit 8, 16 and 32) for the Unknown after Flags (Though so does TS\isoTemp\ufo.tem). comp 3 or none based on resulting size. Same as 50/50 if there are shadow frames? Are all the flags used? Maybe a few (e.g. the last 3) of them can be used to store some of your additional info in them. 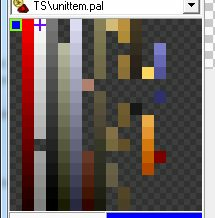 With 3 flags you could store already 9 different values like TS/anim, RA2/anim, TS/unit, RA2/unit, etc and thus load an appropriate palette. Some of the SideNC's work with mpscore's palette but others don't (Such as smlogo.shp). They do exactly what they say. Best is best, 50/50 is 50% compressed and 50% not compressed. All compressed uses compression for all. None is for none. There is no concept of shadow frames as there is no way for it to know what has shadow frames and what doesn't. My understanding is that 50/50 should be what you want with SHP's that have shadow frames. There is no Comp 3. 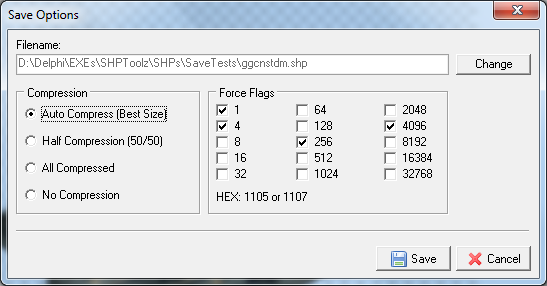 For what was Comp 3 you would have to enable 1 in the Force Flags bit as compression is flag 2. Even if they are not used in the official SHP's they may be used by the game. Adding data to unknown flags/etc is far more risky than adding data to the end of the file (Since the latter isn't in use by the format). There is no others in that bitfield, and there is no other bitfields in the Header. "RadarColor" is actually a common/average colour, "What would this shape look like if it was resized to 1x1 pixels?". When asking Joe Bostic about the format, he said this was added for a general purpose, but of course used afterwards in the radar code for plotting the radar pixel. How about alienating the radar colors for your additional data stucuk? Unit, building and animation SHPs, they all don't use the radar color. Only Overlays like Tiberium and maybe also TerrainTypes (not sure) use it. for the 90% units,buildings and animations SHPs out there, your program should this way store the additional type data fine in the file, without messing up any engine or decoder that reads them. Granted its a 0x0 frame, but one has a 4 and one CCCC. It also uses that unknown field (The one before the offset) thats normally all zeros. The two bytes after "Flags" (Which iv named "Unknown") seem to either be 0000, 006C, CCCC, 0056 or 0059 (I am talking about frames with an actual size). I am leaning towards flags being a dword. But is it RGB or RGBA. No. I am not putting data inside existing header data. That would be abusing the format. Also its not an overall solution. Doh i thought i checked all palettes. Thx. Me and Hyper are at a impasse, ShapeSet exe shows there's only 1 and 2, the games files consistently say otherwise. Hyper is hell bent on believing ShapeSet, i think given the team that worked with that particular version of shapeset only worked on buildings and units this version was simplified to minimize confusion on what to use as seems the ideal is those two flags for the shps based on what WW's files have. As for CommonColor, the forth byte might be a bitfield for how this color is treated or something, doesn't seem relevant to the C&C engine tho so i guess just ignore it. Oh yea Flag 1 in TS and RA2 are two different things it would seem. If a shp is made with shapeset with the -x command line which sets this flag, it crashes in TS but renders fine in RA2 but that's only when the Wdith is set before the frames by ShapeSet. Dunno whats up with this system. From what I can tell, it's just RGB. I just edited an overlay with a HEX editor and I replaced the first byte after the actual radar color (since this SHP was created with XCC Mixer, that means it's the first byte after every instance of 00 00 07). The original value was 00, so I replaced it with FF for all of them and then started the game with a map where I placed won lots of this overlay. Before I applied the change with the HEX editor, I saw lots of black dots on the radar and after the change it was still exactly the same. To make sure that the byte I replaced was truly the one that came right after the radar color, I then also replaced every instance of 00 00 07 with FF 00 07 and checked the radar color ingame again, which then turned red as expected. To make extra sure, I took a screenshot this time, then replaced the first byte after every instance of FF 00 07 with 7F and then took took another screenshot so that I could compare it with the first screenshot, but the radar color was still 100% identical. So the 4th byte doesn't seem to do anything to the radar color at all. It would've been useful if the radar color of certain overlays or terrain objects could be turned transparent or invisible, so that's too bad. The best alternative to that is for this tool to automatically use the average color of every frame, just like SHP Builder does nowadays. Well it does seem like specific data but it may be ignored by the games. I havn't done any testing, only looked at the files. Flag 1 is valid for TS. Etc. TS and RA2 both use 0, 1 and 3. RA2 has some 2's (Though just with the fence's afaik). Flag 1 seems to indicate Zeros(Or Transparency). If you look at canister.shp for example it only has flag 1 when the frame has #0 in it. Fence's in RA2 don't have have flag 1 when there are no #0. So id go on a limb and state that flag one should only be set if there are #0's in the frame. From what I can tell, it's just RGB. Thanks for testing. I will make it get the average colour unless people require it to also have manual selection. Hmm -x is something else, it seems to only add the extra Width to every frame start if the source image is larger than 300x300? (need to recheck at some point) and this is a feature introduced in RA2, with the extra Width specified it crashes the game in TS. Whats the difference file wise? As in what is it actually setting in the SHP? Guess what you can call it is DontIgnoreZeros or AccountForZeros or something like that. Need to check but i think these are prioritized to be drawn pixel offsets but hope you get the idea. If Flag 1 isn't set the game would skip?/lazily read?/partially read?/not prioritize rendering? all the data to the point where the rectangle that is formed from the width and height and positioned based on those offsets is specified. What? I mean the -x thing you are going on about which crashes the game. Besides the Width in front of every frame dunno anything else. Get ShapeSet from http://www.ppmforums.com/viewtopic.php?t=38429 and try testing yourself. Start with a 512x512 pcx to be sure and scale it down until it hits where the extra Width isn't set anymore. Note for whatever fucked up reason the palette is read from the pcx upside down.. I never implied it was not, I was just sharing the information given to me from the guy who wrote the format himself. and try testing yourself. Start with a 512x512 pcx to be sure and scale it down until it hits where the extra Width isn't set anymore. Not going to do that. Randomly trying to recreate something isn't a good use of time when you could either upload ones which crash TS or show the frame data. Worth noting that WW used the -X and a letter in command line in C&Cs (such as -XM to enable Monochrome debug printing to mono screen) for debug modes, its possible ShapeSet's -X is for debugging something. The point of me not is that i have alot to do as it is and you can easily just send a SHP that fails with TS and i can inspect its data to see whats different between it and a normal SHP. Its also possible i would get different results either from me not doing everything you did or simply due to different data or settings. Implemented Import/Export 8-bit BMP Spritemap. Since the Palette is stored in the BMP its impossible to have colour conversion errors. It will be larger than filetypes like PNG since its uncompressed but you can put them in ZIP/RAR's if you want to share them. It stores the Width, Height and Frame Count in the filename when Exporting which saves you having to enter them in the Import Settings bit. - The UI is good, no suggestions there. - I like the animated preview when selecting an SHP file. - I think the current min and max luminosity values are sufficient. - It would make sense for the luminosity of the fake map background to change as well, but it could be an option instead of a forced thing. - A minor thing: If the current SHP is considered a shape with shadow frames (i.e. a unit or building), and you play the animated preview, the preview always skips the shadow frames. You cannot "force" it to show such frame either by moving the slider to a shadow frame. There should be an option to allow viewing shadow frames as well. - Request: There ought be a tool name/description above the luminosity slider. - Request: A fake snow background. - Request: A way to change the speed of the animated preview (on the main window). Implemented ability to load background tiles. Before it was just a static image but now it will tile. Right clicking on the Draw Background button will make a popup menu appear where you can select the background you want (Its populated based on the PNG files it finds in the Backgrounds directory). 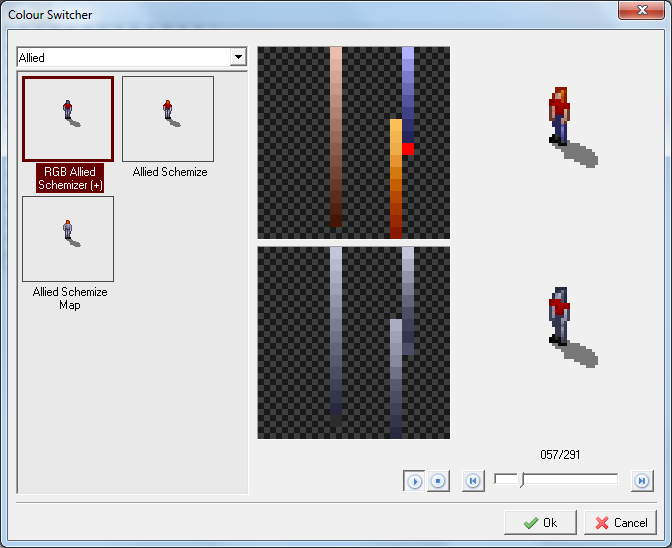 Also changed the Animating logic so it will only treat the "animation" as having shadows if "Draw Shadows" is enabled. Otherwise it will play all frames (And not draw the shadows on non-shadow frames). Implemented Used Colours Overlay for the Palette. Also modified the Open Dialog so that it hides any SHP's which arn't valid TD/TS SHP's (Like TMP files). Does have the side effect that the scrollbar may suddenly shrink as its only checking them when they come into view and then hiding if they are invalid. P.S If you left or right click a pixel of the image it sets the Left/Right colours on the palette. Its been able to do it for quite a while but i never mentioned it (Your able to use it with the last released build anyway). 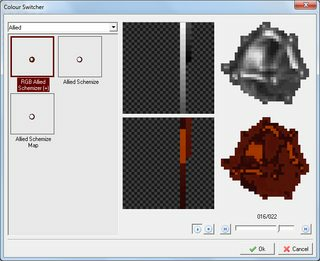 Can you implement frames halfening tool? I find often got too many frames and need to reduce and doing this manually is just slow and if shadows are turned on, it should remove the counterpart shadow frame. if shadows are turned on, it should remove the counterpart shadow frame. It doesn't need to care if shadows exist. 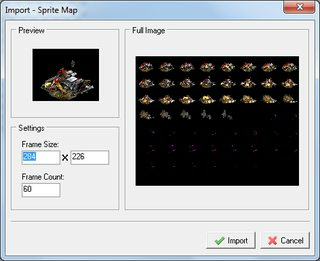 It will work out correctly as your removing all the odd frames (So you would remove the counterparts since the SHP has even frame numbers). The only instance where it would fail would be if you had 2 frames where 1 was a shadow (Since it would be forced to remove the shadow). But if there are an odd number of normal frames, for every removed normal frame it will remove a "wrong" shadow frame, not the one corresponding to the normal frame. Btw, I tested it on a building SHP with 6 frames total and it removed the shadow frames completely, leaving only two of the normal frames. What millisecond values(Like 10 of them) would you want for the animation speed? Current is 200ms which is 5FPS. Minimum is 16ms in Windows 7, XP i think was 20ms. 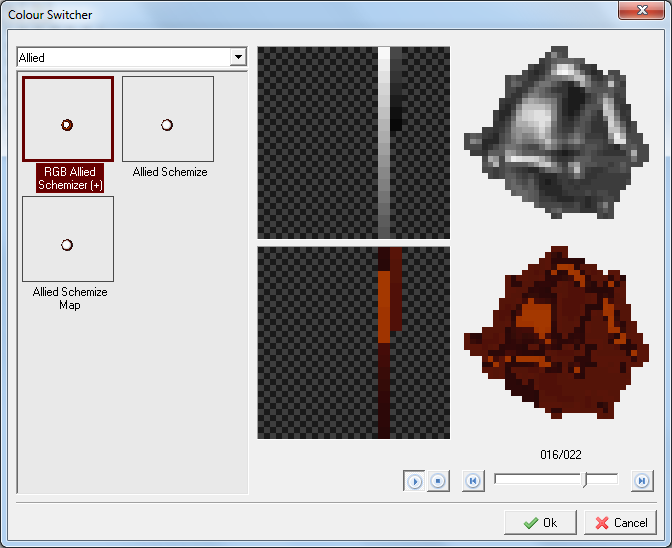 Implemented Colour Switcher. Its the CScheme thing. Still need to add a ComboBox to hold the CScheme Categories (So you can filter the list), preview's need the transparent square background thingy and i need to optimise the default cschemes by shoving them in a binary format as it takes way too long to load >250 of them when they are ini files(INI ones would still be supported, just the default ones supplied would be shoved in a single binary file to optimise the loading). Anim FPS could be from 5 to 20 or 25 FPS. Only felt the existing one was a little slower. The unused colors could be shown with pure colors like pink, cyan or bright green etc. color that does not exist already or give an option for the user to choose. Edit: Or a pattern like checkered used for transparency or a filled circle or a cross. Couldn't see the save options in last download, are you giving a separate option for that? 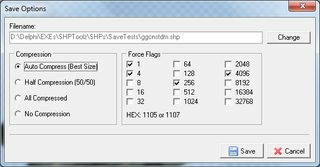 For me export and import are the most used feature of SHP Builder apart from viewing. - choosable palette (palettes in case of RA2 civil buildings) in which import has to be done. have choices like Delta-E 2000 etc. Look in SHP Builder. After selecting a filename the save options appear. Why would you need non-index'd images? 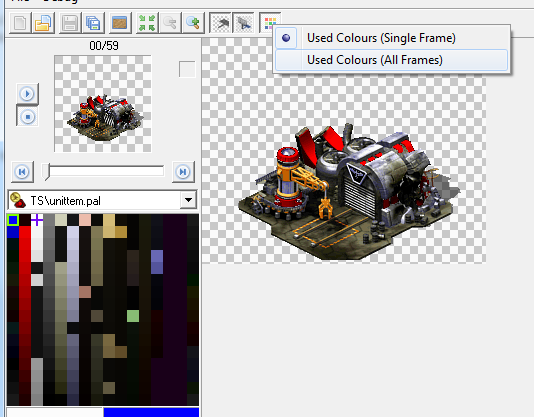 Your losing colour information when importing and editors like Photoshop/Gimp work fine with 8Bit palettes. Its not like you can use colours outside of the 8Bit Palette. I can understand generating the images in say 3DS Max and needing to import it, but not exporting so you can work in 24bit. SHP's can have 65535 frames max(Due to Count being a Word) so the limit should be that (SHP Builder can handle SHP's with that many frames. Though the spinedit control is limited to 3000 for some reason...). 9800 sounds like a very odd number. Pure Colours which are already used in the palette would be a bad idea. Checkered is better as you can easily see whats not a colour. doesn't change color of an image but only its color table or palette which is not useful. SHP Builder, not a hardware limitation. Checkered pattern looks fine for unused color. The dark gray could be darker. For the framerate i would suggest implementing it in the same way WW has done it on the Rate= key, so you can see how it would look ingame with the same setting as in art.ini. The fastest the game can show is Rate=900 which is a delay of 66.6ms. Editing indexed images in Photoshop is restricted, features like selective color editing won't be available as those need RGB value to run the algorithm. Moreover editing doesn't change color of an image but only its color table or palette which is not useful. It has it's uses. 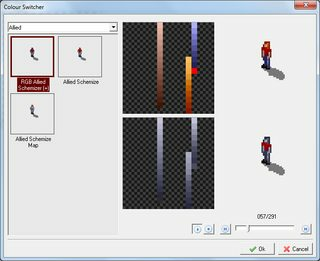 I have many times found that quite useful when I was creating custom palette variations for the same animation. OTOH, GIMP works completely the opposite when it comes to indexed mode, it cannot shift palette colors and don't flatten the image beforehand, so it's the tool you'd find useful. It must be something in the conversion code. Since it can literally load SHP's with 65534 frames (I never tested 65535 as my test had shadow frames) it has to be able to store the actual frame data in the SHP structure it has. P.S I don't know if i will code Paint like tools into it at this stage. 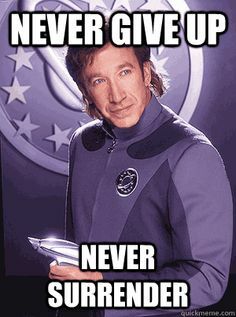 My current strategy is to work on everything else and then decide. If i did it would be a layer system and id have to create a custom format to store the editor data. entire SHP for unused colors. custom palettes in the past with Photoshop. Haven't used GIMP in several years now. 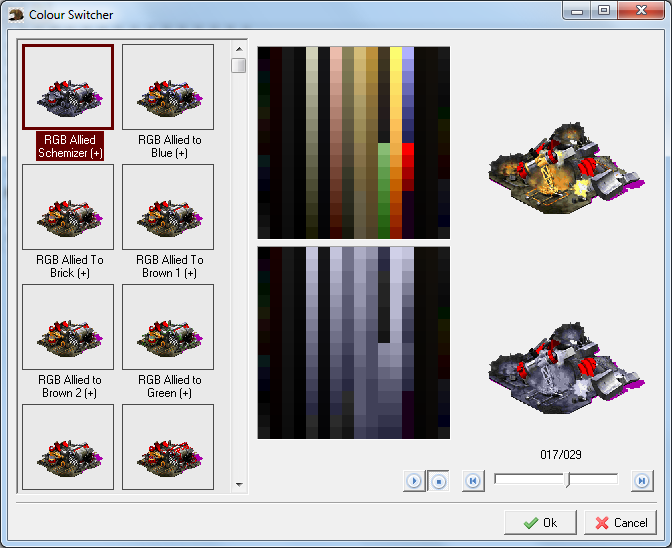 Updated Colour Switcher Progress. Any CScheme which will have no effect on the SHP is hidden, also added categories which show/hide them based on what their category is (Called Game in the CScheme file, but Brown 1, Brown 2,etc are not cnc games i know of ). The Palettes in the Colour Switcher will only display the palette colours which exist in the SHP and which are changed by the CScheme. I added unused colours, though its just the opposite of used colours. Implemented the Binary CScheme file for the default included CSchemes. Its 70KB (Compared to 560KB) and loads instantly instead of taking something like 4-6 or more seconds to load. I started work on the backend for a Layer base editor (Id like to note i may never finish it. No Guarantees). It will be designed internally for speed and ease of use rather than lower memory. 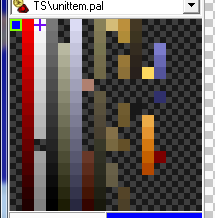 For example, each layer will be a full sized palette image rather than just the size thats actually used. Benefit being that coding is easier and it doesn't need to be reallocated each time the used area of the layer changes. The negative is that it will use more memory, though unless you go crazy on layers it shouldn't be an issue (A single 256x256 layer would be ~65KB). I got slightly more info now on this, i found where YR checks bit 1 and Hyper helped me figure out what's going on in ShapeSet. You are correct that's practically it. When Flag 1 is set that means the image had the specified Transparent index in it, in ShapeSet default check is for index 0x0, you can overwrite it with the command line -T## for example -T01 would make it assume all index 1 pixels are transparent pixels -TFF all index 255 and so on. Its unclear to us right now why any other values appeared but game only checks for bit 1 and 2, 2 is indeed confirmed as RLECompressed.